Want a fast and delicious summer salad? Try this! It was yummy. Put all in small jar, shake vigorously to blend. Wash asparagus, snap off tough ends. Toss with dash of olive oil, and a dash of freshly ground black pepper. Lay out 1/2 slices of prosciutto, sprinkle with shaved parmagiano, place a spear, and roll up. Place on foil lined cookie sheet that has been sprayed with olive oil. Continue until you have about 20 spears. Bake at 425 for 6-8 minutes. 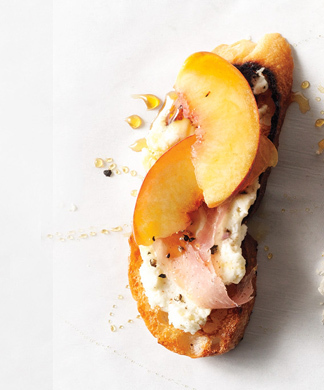 Watch for when prosciutto starts to crisp, but don’t burn. Mix arugula, cucumber, cherry tomatoes and dressing. 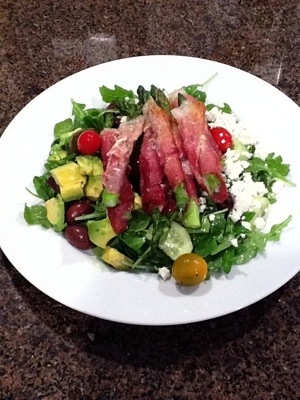 Put on salad plates, add avocado, feta, olives, then cooked asparagus. It is hard to match a wine with asparagus, feta, and vinaigrettes in general, but we enjoyed a Cakebread Sauvingnon Blanc that seemed to work fine.